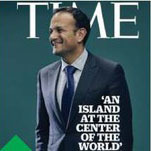 Mr Taoiseach has made the cover of Time magazine. It’s Time Europe, but still... not bad. Now everyone can keep calm and Varadkar-ry on with the rest of our lives.